So drawls Tom Hardy in Lawless, as he explains to younger brother Shia LaBeouf the importance of cultivating one’s mythological status amidst the bleakness of the American Prohibition. The problem with John Hillcoat’s new film is it’s all about the violence: there’s never a sense it’s getting to grips with the context of the period, or exposing the manifest ironies of mortals attaining legendary status. Based on Matt Bondurant’s book ‘The Wettest County in the World’, Lawless centers on three brothers who operate a bootlegging outfit in Franklin County, Virginia during the 1930s. It’s a volatile time, with the country folk under increasing threat of violence from inner-city criminals. LaBeouf is the youngest brother Jack, an eager beaver whose desire to get more involved with the business sees him pitching to Chicago mobster Floyd Banner (Gary Oldman). A hulking Tom Hardy is the stoic older sibling Forrest, a quiet presence given to explosions of messy violence. Jason Clarke completes the trio as perpetually inebriated Howard. The family operation, and those around the county, soon come under threat due to the presence of oily, perfumed Federal Agent Charley Rakes (Guy Pearce), a psychopath who makes up in brute force what he lacks in the eyebrow department. Rakes wants a cut of the brothers’ profits, sparking a classic Wild West confrontation between the rubes and the city slickers. LaBeouf’s juicy opening narration promises a drama that will hit the back of the throat (and everywhere else). Describing the moonshine stills as lighting up the wooded hills ‘like the lights of a Christmas tree’, it looks as if Hillcoat is promising a poetic deconstruction of a feuding landscape in the style of his terrific film, The Proposition. Sadly, despite the wonderful work by the production designers, costume team and cinematographer Benoit Delhomme, the script takes only the most superficial interest in the setting. Although the film convinces you of the period, it never tells you much about it. This is a real shame as both Hillcoat and writer Nick Cave (who also co-scores with Warren Ellis) explored the awful savagery of violence to wonderful effect in both The Proposition. Hillcoat’s previous film The Road was also fascinating in this regard. Ultimately, Lawless is your token Hollywood story of good guys taking on the pantomime baddie. Compared to such seminal works as John Sayles’ Matewan, in which striking West Virginia coal miners face off against the hostile Baldwin-Felts detectives from the city, Lawless is oddly diluted moonshine. Matewan drew on staples of the Western to witty and dynamic effect, from the cinematography to the score; Lawless doesn’t so much give us characters as broad archetypes. That the central figures are watchable at all is down to the casting. The movie lucks out thanks to the skills of brilliant performers who do so much with body language, glances and gestures that we can overlook the weaknesses in the narrative. LaBeouf blooms under Hillcoat’s direction, his puppyish energy coming unstuck at the hands of a vicious beating courtesy of Pearce’s sadistic villain. Hardy shows his mastery of yet another accent and is able to marshal his bulk to create the sense of a dangerous yet compassionate man looking out for his kid brother. Although he’s massively built, Hardy plays Forrest as an intriguingly reserved presence, only resorting to violence when he needs to. Pearce meanwhile is little more than a cartoon villain with parted hair and leather gloves but is enormously entertaining nonetheless, clearly riffing on Tim Roth’s performance as the effete but ruthless dandy in Rob Roy. None of the actors cited are given anything especially substantial to do but their instinctive talents help convince us, even when the script is lacking in-depth. What a pity that many of the other stars are given even less to work with, especially Oldman, who does so much with 5 minutes of screen-time that it’s frustrating he isn’t given more. Jessica Chastain and Mia Wasikowska are the women in Hardy and LaBeouf’s lives respectively but any grace notes stem directly from the actresses themselves, not the script’s rote treatment of them. There’s no denying that the film deploys a sense of bone-crunching gusto that is highly entertaining. But what we really want is a deconstruction of those words growled by Hardy, a meaty commentary on how people perpetuate their own legend in times of hardship, to be reflected in both Hillcoat’s visual sense and Cave’s script. In the end, we simply cheer the heroes and boo the baddies. More is expected from the mouth-watering combination of a great director and a turbulent period in American history. 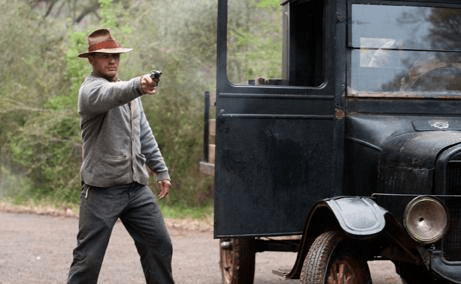 In the end, Lawless, rather disappointingly, plays it safe, an enjoyably full-blooded, adult experience but a superficial one nonetheless.